This Brazilian only release has a colour photo cover of the band. 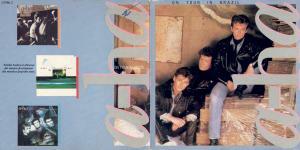 The reverse of the LP is blue with three small a-ha pictures. It comes with an LP-sized fold-out card with the picture from the cover and a picture of Morten holding a cup and a picture of Pål and Magne sitting on reels inside. The reverse features pictures of the three previous albums. The CD edition is quite rare. It has a similar cover to the LP with the reverse of the front insert is similar to the fold-out card which comes with the LP. The back insert is light blue with a mirror image of the large a-ha logo used on the front sleeve on the left hand side. The track list is printed in black down the centre and there is even a gap between "Maybe Maybe" and "Hunting High And Low" indicating that it uses the same artwork as the LP. The disc is plain with black text. The a-ha logo and title are at the top, with the track list on the right hand side and record company information on the left hand side. There are a very limited number of test pressings which have the same catalogue number. They come with picture sleeve and fold-out poster. The disc label is almost plain white disc label with a small amount of text. This album was also available on cassette. The cover is blue with the band shot in the centre with a white border. Above the picture, the a-ha logo and title are printed in black. The tracks are listed on the flap which folds inside the cassette box. The cassette itself is white with black text. Note: The track "Maybe Maybe" is credited to Mags Waaktaar!